The great conquerors relied heavily upon the horse. 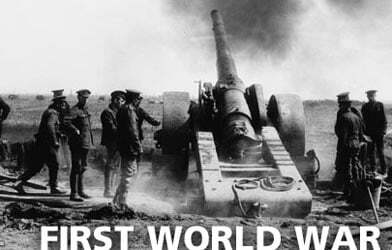 World War One caused terrible bloodshed as millions of soldiers slaughtered each other for no apparent gain. Yet, directly due to fighting, the civilian death rate in this conflict numbered perhaps 15% of all those killed. In the Second World War, and thereafter, non-military death tolls precisely from battle have soared beyond comprehension. In America’s wars spread across Vietnam, Cambodia and Laos (1960s and 1970s), the civilian loss of life was two thirds or more. Just over a generation later, following the US invasion and occupation of Iraq, the civilian kill rate hovered at around 90%. One important reason for the cruel disregard of non-combat personnel, is that mankind’s weaponry has become increasingly powerful. Technological progressions of the past seven decades and more, particularly in America, have had inevitable bearings on how the Western empire conducts war. Advancements in the destructive strength of airplanes, tanks, machine guns, and so on, has detrimental effects upon the mindset of political and military leaders – impacting the ordinary soldier too, whose distribution has been scaled back. Largely gone also is the ancient distinction between uniforms, as America’s often bewildered forces fight an unrecognizable enemy hidden in the shadows. A separate critical cause of the rise in civilian fatalities, is that modern warfare has become an especially lucrative industry, as vested interests gain footholds. With corruption becoming widespread, the Iraq War was immensely profitable for influential corporations and public figures; president George W. Bush’s brother, Neil Bush, was reportedly paid an annual fee in aiding Western businesses to obtain contracts in Iraq. America’s military spending, already by far the world’s greatest, has at least tripled since the year 2000. This enlargement occurs despite the “hordes from the east” having long disappeared since the USSR’s 1991 collapse. One of the most telling introductions into warfare has been the large-scale employment of the airplane, invented in 1903 as an innocent means of adventure and fun. It would soon be put to other uses. Successful combat from an aircraft was first observed on 5 October 1914, when French aerial gunner Louis Quenault fired his Hotchkiss machine gun at a German reconnaissance airplane, near Reims in the north of France. However, it would not be until the latter half of World War II (1942-45) when the aircraft had really significant impacts – as America and Britain utilized their heavy bombers and fighter planes in fleets of hundreds. Over a few short days in late July 1943 the Allied firestorming of Hamburg, in northern Germany, produced more fatalities than the Luftwaffe’s Blitz of Britain (September 1940–May 1941). The Blitz lives on in infamy while the much greater destruction of German cities is mostly forgotten. As many as 600,000 German civilians died due to British and American air raids, while about 40,000 Britons perished during the Blitz. The Western powers were pioneers of formidable four-engined bomber aircraft, such as America’s Flying Fortress (introduced 1938) and the British Short Stirling, brought in two years later. These warplanes carried significant bomb loads and travelled tremendous distances; unlike their German counterparts, which all initially possessed two engines and were much smaller by comparison. A particular favourite of Hitler’s, the infamous “Stuka” divebomber (introduced 1936), with its soul-sapping siren, had a maximum flying range of 200 miles. Yet the RAF’s Short Stirling could roam 2,300 miles without stopping, and America’s Flying Fortress for 2,000 miles. The Stuka’s bomb load weighed at most 1,300 pounds, as opposed to the 14,000 pound payload the US Flying Fortress held. In early summer 1944, America ushered in the B-29 Superfortress to deadly effect; these 100-foot long bombers incinerated swathes of Tokyo in March 1945, and by early August were sent to drop atomic weapons on Hiroshima and Nagasaki. The atomic bomb itself was first successfully tested in New Mexico’s desert on 16 July 1945, despite fears from scientists its detonation could ignite earth’s atmosphere, destroying possibly all creatures on the planet. The post-World War II years have witnessed hair-raising games of cat and mouse with increasingly powerful nuclear weapons, played out in the background as people go about their daily lives. “The ultimate aim of the attack on a town area is to break the morale of the population which occupies it”. To achieve this British pilots, “must make the town physically uninhabitable” while producing “destruction and the fear of death”. From the early 1940s, there no longer existed a discernible difference between the soldier in the field, and a person in the factory or street. Non-combatants in Germany and Japan were fair game, and this moral degradation became too apparent in years to come. During the 21st century, relentless developments in military technology are borne out by the drone’s increasing usage. As the years go by drone attacks grow at a steady rate, despite the severe ethical questions arising from their deployment. It reveals much that this drone warfare warrants so little mainstream criticism. The wanton targeting of humans from an unoccupied aircraft, high in the air, seems par for the course. Through drone attacks, suspects are not even detained let alone brought before trial, but simply liquidated to save the trouble. Many innocent bystanders are also killed. drone assaults “would have been unthinkable in previous times” and that it “abets our enemies and alienates our friends”. The public are themselves exposed to propaganda techniques on drone raids, from cultural outlets like the American film industry. Reality is somewhat different. A 2014 study on the “accuracy” of drone attacks emerged showing that in Yemen and Pakistan, for each target killed, an average of 35 others also died. In early October 2001, the first US drone strike took place – a failed execution on a Taliban leader – in Afghanistan’s second largest city, Kandahar. Over the elapsing years, thousands have been killed in drone attacks across the Middle East and elsewhere; the US military possesses an array of these airborne craft, scores of which are continually operational. Throughout the decades, America had stood alone as a truly remarkable country in its technological capacity and industrial might. As the Second World War was commencing, in 1939 one American out of every three possessed an automobile. In 1939, one person from 47 in Nazi Germany owned an automobile, and even then there was regularly a fuel shortage. It hands an insight into some reasons that the Nazis lost World War II, such as the Reich’s limited production power and access to raw materials. During Hitler’s brutal 1941 Soviet invasion, the most prolific tool in his war machine was the horse – a powerful, multi-purpose animal exploited across many centuries, from Julius Caesar and Genghis Khan to Napoleon. Yet even a horse can only do so much, as it requires daily nourishment and care. Horses can unduly be affected by cold, wet conditions common in Russia during the autumn rains. At the direction of their German masters, up to 750,000 horses trotted eastwards in June 1941, alongside about 3,500 panzers which rolled along seamlessly, as 2,000 Luftwaffe warplanes roared overhead. The horse was a favourite instrument of Nazi infantrymen, and publicity photos of German soldiers astride these animals were common. It would be ironic indeed that, in autumn 1941, while the lauded panzers came unstuck in the great Russian mudflows, horses were seen galloping or wading through it. As the war advanced, average numbers of horses in the German Army reached a staggering 1.1 million. Countless horses died in combat and were also killed to feed half-starved soldiers, both Russian and German. The Wehrmacht’s global image as a mass motorized machine was another illusion cast by Joseph Goebbels, the propaganda minister. A heavy dependence on the horse did not bother Hitler in the slightest, who was antiquated in his vision of warfare, only turning desperately to “wonder weapons” when the conflict soured from 1943.